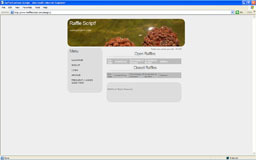 RaffleScript.com - Run a Profitable Raffle/Lottery Website with this Unique Script! Let us help you get started. Click here to learn more. This script allows anyone to run a profitable online raffle website. It is very easy to use for both the user and website owner. With this unique script, you will be able to run as many raffles as you like, profiting from each one. Your website will be able to grow without advertising due to the script's referral system. Users make 5% of what the people they refer win. This will allow your website to grow as people post their referral links all over the internet. Another distinguishing quality of this script is that a percentage of the people who enter win, not just 1 or 2 people (you determine the %). Thus, you will plenty of happy winners spreading the word of your website. The profit potential is huge! As the Admin, you will determine how much of the pot (the money collected from the raffle) goes to the winners. You will keep the rest. Even by giving away a substantial percentage of the pot (such as 90%) you will be able to make hundreds a day, running multiple raffles. Please take a moment of your time to review the various features the script offers to both users and the website owner. View list of winners for past raffles. See time of their last login. View number of failed login attempts within the past 24-hrs for their account. View their account balance, winnings, referral information, ticket history, etc. Users make 5% of what their referrals win! Disable image verification on any part of the site. Search through the user database, using a variety of information. Suspend/Unsuspend users for any set amount of time. Create as many raffles as wanted with a click of a button. Raffles completely customizable. The admin can set the duration, ticket price, percentage of user’s who win, percentage of profits that will be given away, etc. Randomly or manually choose winners. Easy to manage support system. Add categories to "Support Ticket" section. Add questions/answers to the Frequently Asked Questions section of the website. When the Admin answers a support question he/she can choose to have the question/answer submitted to the FAQ database! Display and close idle accounts. If a suspended user attempts to create an account, that new account will be deleted and his suspension (on his original account) will be extended. The admin will be able to view the details of the fake account. PayPal parser allows admin to easily credit users’ accounts when they deposit money in order to purchase tickets. Credit users' accounts manually when they deposit money. 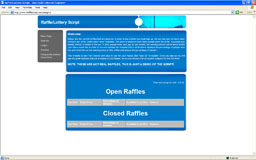 Profits page displays the profits the site makes off each raffle. The Admin can reset this counter with a click, when he/she withdraw the profits from the PayPal account. Easily archive finished raffles to conserve space in the database. Manually purchase a ticket (to a current raffle) for a user. Find users with the same IP in the database, in order to prevent fraud. Display full user information including number of referrals, date of registration, last login, name, address, and much more. Find out if a user is currently active on the site. Display list of winners who need to be paid, once the Admin pays a user, the winners name is deleted from the list. Display how much money in the Admin's PayPal account, is due to individual user deposits (in order to purchase tickets). Passwords requests can only be made once every 10 minutes (this number is editable). Users must pass image verification in order to login, request password, signup, and submit a ticket. This prevents programs from spamming the website or performing combinatory password attack (in an attempt to gain a user's password). Script has been tested and secured against SQL injection. Every user inputted value is filtered before anything is done with it. Users can view the number of failed login attempts for their account within the past 24-hrs. The script comes with 3 different designs! Implementing new designs only requires editing 2 files! 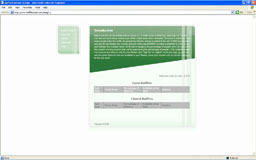 The design is fairly easy to modify using Dreamweaver, FrontPage, etc. We recommend that you have at least some knowledge of HTML. Upon payment completion, you will receive the script within 30 minutes. The script will be in a .zip file. The script will come with the 3 designs shown above. Installing the script will entail editing a file (in WordPad, NotePad, or the like).